Last night it finally happened; the zombie hordes rose up and stormed the city. Well, a big chunk of Sheffield at least. 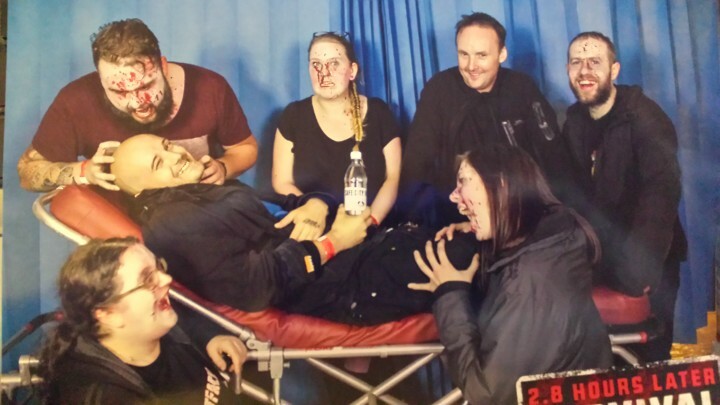 2.8 Hours Later, billed as the city-wide zombie chase game, hosted their first ever event in Sheffield, with hundreds of participants braving the zombie horde to retrieve supplies from the infested city. It was daylight when we arrived, with a jovial party atmosphere forming outside the bland industrial building that was to be Asylum, our base of operations. While queuing and signing waivers we were able to scope out the competition / fellow survivors. We had a group of dancing ninjas, an 18th birthday party and a hen night, as well as a bevvy of others with varying degrees of costumes, branding and enthusiasm. Once inside we were issued with our wristbands, asked politely not to cheat and ushered upstairs to mission control. There we were given maps, instructed to login to get our first map reference and I was selected as the water carrier with loud instructions to protect the water carrier at all costs – nice! Then, with a quick stop by the facilities, off we went into the impending dusk. We decided to take the canal towpath to our next waypoint, assuming it would be a safer option. We started out with the plan of “avoid, outrun” then I guess next would be “confront” but that’s against the rules. However, when we got to the path and found the signs we realised that we were following the planned route. Oh well, how bad could it be? Minutes into our walk down the path, all somewhat on edge, we approached a distressed woman, shouting for help and first aid as her friend on the run had hurt herself. I know there were at least two first aiders in our group, including myself, and we were all sensibly cautious. Our caution paid off when we saw the injured friend, a vision of gore and undeath, thankfully without legs. Our first encounter with the living dead resulted in little more than a wide berth and slightly fast walk. This did very little to prepare us for the rest of the evening! For years I have avoided all sorts of exercise and dismissed plenty of activities under the premise that I can’t run. 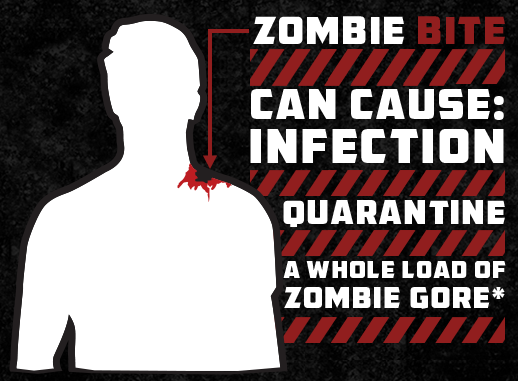 Well, sadly I can no longer use this excuse, as enough people have seen that when the shambling, blood-covered zombie turns to me, shrieks and suddenly sprints right at me, I can run with the best of them! No easy Romero zombies here, if you got too close, made too much noise, or were foolhardy enough to be wearing a precious backpack (aka bullseye) the screaming, growling (and very convincing) undead would deliver an incredible turn of speed. 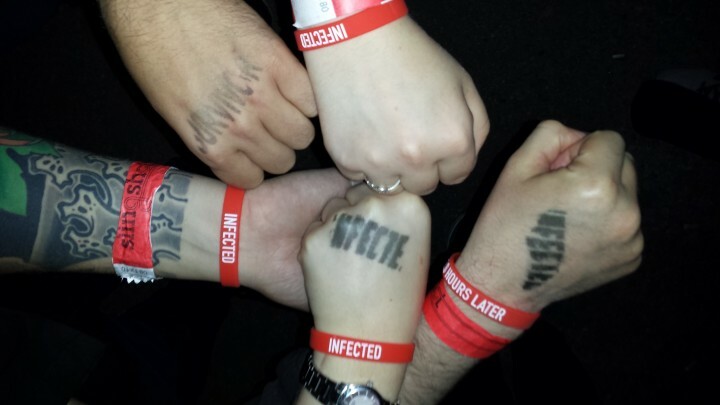 Our team completed our mission, however 5 out of the seven of us ended up being stamped ‘infected’ and sent away to be made up as zombies ready for the zombie disco. Most of us lasted a while, but by the end, I had handed over my backpack and been caught twice. It was only when I got caught that the illusion slipped for me, having to stop and allow the zombie to scribble on my hand with a UV pen. My Britishness left me wondering whether to thank the zombie and wish it well, compliment the volunteer on their good monstering or just blank them and walk away. I chose to converse with them in their own language, screaming in their faces and running away. It’s funny what adrenaline will do to you. This is not a cheap night out, and it is not easy, but it is a ton of fun! The event ran like clockwork, everything very well organised and flexible, the actors and volunteers were all brilliant. The make up especially was great, I’ve definitely seen movies with less convincing zombies. The website originally promised an app integrated into the experience with maps, choices, etc. but this was not to be I guess. They did use technology in a really creative way, which meant it wasn’t a smartphone exclusive event. We are all planning to go again next year, and all hope to survive, though not by taking the main roads (easy route). It is fairly easy to guess where the ‘action’ will be: if you see a road closed off with an event steward then you can be pretty sure you’ll need your running shoes soon. As wrong as it feels to follow signs and do the expected, we kept reminding ourselves this isn’t a test of how well I know my way around industrial estates, we paid for zombies, so we’d better go where the zombies are. All in all, a brilliant night, highly recommended for everyone even slightly physically capable. If you are at all interested in zombies and apocalypse ideation then this is the event for you. There are already videos up on YouTube of the Sheffield event, as well as plenty of the previous events. 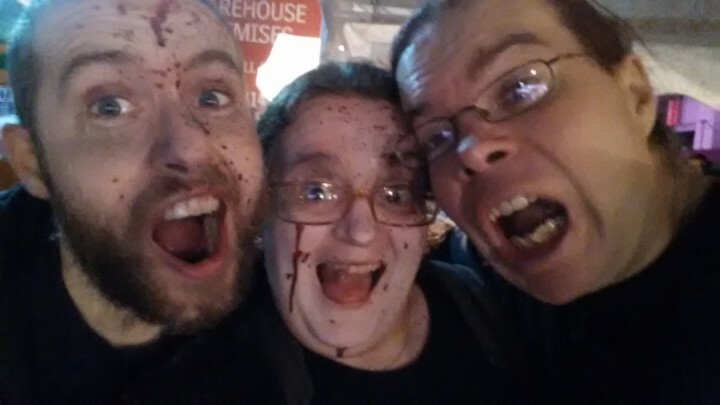 The best thing that could be done to improve the adventure would be to have more of everything – more zombies, more actors, more props and technology, and a bigger and better party afterwards. I can’t wait for next years zombie uprising! I'm Mel, currently living in Sheffield, but originally from the other side of the Pennines. I'm a lifelong gamer, RPing from a worryingly early age, and basically raised as a geek - I don't think I ever had another option! Any spare money I have gets spent on comics, photo gear or lucha masks, and any spare time I have, when not gaming with friends, is wasted on Sims, Minecraft and trashy movies.